I have had problems running Small Business Accounting 2006 on Vista and created a support case with Microsoft. The response was that SBA 2006 is not supported. I needed to use Office Accounting 2007 Express or Professional which can be downloaded at the following links (http://oaisbetter.com or http://www.ideawins.com). I chose to upgrade to Office Accounting Professional 2007. Unfortunately I ran into a problem trying to install SQL Server Express, even though I already had SQL Server 2005 installed and working with SP2 CTP2 (required for Vista). After backing up my SBA and Outlook Business Contact Manager (BCM) data, disconnecting BCM from the accounting database, uninstalling SBA 2006 and SQL Server, the install still failed with a "SQL Server Setup Failed to compile the Managed Object Format (MOF)" error. After hours of searching, I found this post on TechNet, what a life saver. Who knew that a corrupted WMI repository would affect the installation...Thank you Jin Feng. I was able to easily restore and upgrade from my data backups. Office Accounting 2007 provides a feature to integrate the Business Contact Manager database into one (very nice). I have done that and I am sharing my Business Contact Manager data with my XP Tablet laptop. The sharing feature is very easy to setup and provides excellent instructions. You have the option to replicate the data for off line use which is great. After a harrowing day and half, I am back up and running better than ever. Business Contact Manager 2007 (BCM) was finally released on the MSDN subscriber download site this week. As a consultant I have been missing it for the last 3 or so weeks after the release of Office 2007 which did not include of BCM. The only issue I had with the installation was that I needed to un-install the Office Small Business Connectivity components. An error message with a good explanation. I am assuming these components were installed with Office Small Business Accounting 2006 (SBA). As a consultant BCM provides great integration with SBA to track your billable time which then feeds into the creation of invoices. You can use this feature with calendar appointments. BCM also allows you to create projects and associated tasks which can feed into SBA's time entry feature. The integration is excellent for any small business interested in keeping track of employee time against both billable and non-billable projects and tasks. 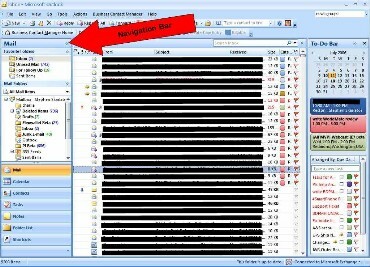 BCM adds additional buttons (circled in red) to manage time from Outlook 2007. No Release Candidate yet for Office 2007, however last Thursday the Office team released a Technical Refresh of the Beta 2 software (B2TR). The B2TR downloads can be found here. The original Beta 2 software must be in place before installing the B2TR update. There is one exception I found to this; the Business Contact Manager add in for Outlook must be unlinked from the Small Business Accounting database (if in use) and un-installed, prior to applying the Office Suite B2TR. Then the new B2TR Business Contact Manager for Outlook can then be installed. The major noticeable improvement with B2TR is speed as well as many bug fixes. They have also polished the user interface and updated the program icons to match the Vista look and feel. I don't think the speed is where it needs to be yet, especially on the rendering side but this version is much more usable and I can recommend to advanced users. If you did not download the original Beta 2 in June, Microsoft is now charging $1.50 per Office application as a download fee. The download has been so popular that they have exceeded their hosting budget and this is their way of doing cost recovery. I also think it is a way to slow the downloads of the Beta before they get RC1 done. One last note, because Microsoft and Adobe never reached an agreement on the inclusion of the PDF file format (see this post), Office 2007 B2TR requires you to choose and install one of two add ins; one with PDF and XPS, or one with just PDF. I am not sure how this relates to licensing, we will have to see what the final licensing plan will be for PDF when RC1 comes around. 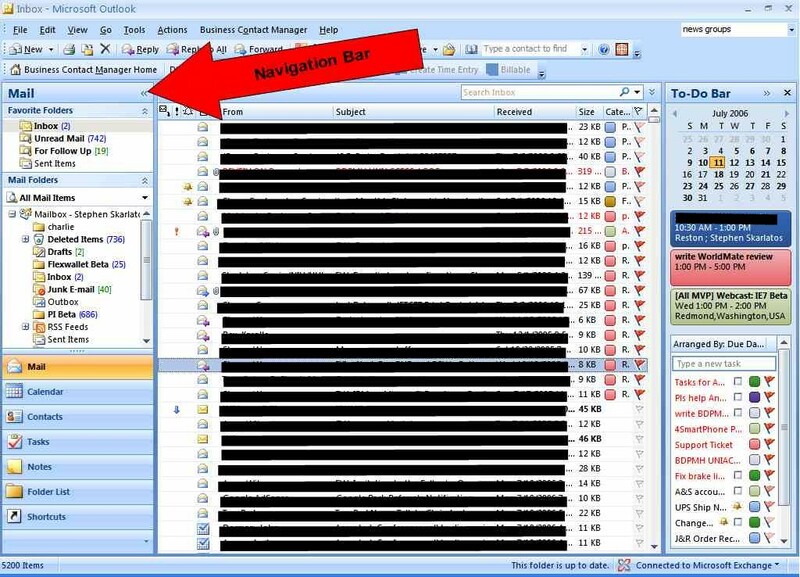 Screen real estate is always an issue with most applications, the Outlook 2007 dashboard concept is no exception. The inbox view is crowded, however the Office team implemented a very elegant solution; they use sliding bars for the navigation and to do displays. These are controlled by the international VCR forward >> and reverse << symbols. The inbox view with the navigation bar fully displayed. The arrow points to the VCR control. The inbox view with the compacted navigation bar. It uses icons for quick access to the inbox, calendar, contact, tasks, notes, public folders views. By clicking on the navigation pane all folders within a view are displayed in a anchored floating window. This view with the navigation and to do bar retracted provides more detail of the inbox data. VCR buttons are used throughout Outlook, giving you the ability to easily customize a view. Other the Beta performance issues I find Oultook 2007 to be a winner. I use Microsoft's Small Business Accounting 2006 (SBA) and just updated it to SP3. 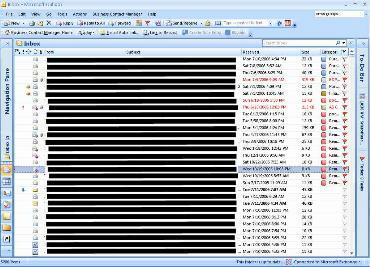 I got a scare when I could not connect from Outlook 2007 with Business Contact Manager to SBA SP3. I primarily use the interconnection to record billable time on tasks and appointments. I was able to get around the problem by disconnecting from the SBA database and reconfiguring the connection. This is performed by using the Outlook 2007 Business Contact Manager menu / Accounting Tools / Disconnect Accounting System, then going back to the Accounting Tools menu item to configure the Accounting System. The integration between SBA and Office makes the accounting system a winner. You can follow my posts on Office 2007 by using the Office 2007 category.